YOU’RE MESSING WITH THE WRONG COUNTRY, SLOVAKIA. MARK MY WORDS. Just to recap. 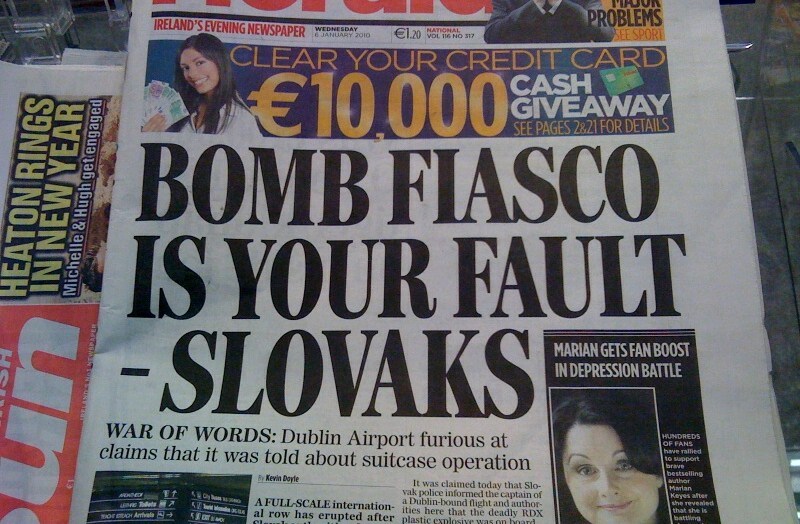 The Slovaks dupe some innocent punter into smuggling explosives into Ireland, potentially endangering, I dunno, some lives. Then they forget to mention anything about it for a few days. Now they’re insinuating that the whole imbroglio is somehow our fault. If that’s the way you want to play it, Slovakia, fine. No skin off our noses. But know this: you’ve made a powerful enemy this day. This isn’t Iceland you’re messing. Do you even know what happens to countries who mess with Ireland? Didn’t Slovenia or someone pull you aside, try to talk some sense into you? They didn’t. Well, that’s unfortunate. Because you’re now going to suffer the consequences of Ireland’s wrath. What are we going to do about it? I’ll tell you what we’re going to do about it. Nothing at first. We’ve just had about two inches of snow here. The country is in a state of national crisis. But once this whole miniscule amount of snow thing clears up, we’re going to launch a no-holds-barred investigation. And once that’s completed, we’ll publish a motherfucking report. And in that report? Oh you know we’re gonna include some stringing criticisms of your handling of this affair. That’s right Slovaks, not so smart now, aren’t you? And if you’ve got a problem with this? Well then we’ll probably backtrack and just say it could have been handled better on both sides. And if you’ve still got a problem? Well, we’ll stand you a round of drinks and give you twelve points in next year’s Eurovision, just so there isn’t any bad feeling. Why? Because that is what happens, Slovakia, when you mess with us. Ireland would totally take those Slovak bastards in a fight!! You’ll ne-ver beat the Irish. If we could trick them into invading we’d have their number after a few centuries. Better yet, we could turn the Irish army on them!! …Or we could have the FCA hurl their boots at them, Iraqi style. Moral victory guaranteed. Yeah right Slovakia, you accidentally put a bomb on a plane and you think the best solution is to send a fax to some baggage handlers. Cos they never make mistakes!! @ Dee – hahaha… I understand Slovakia’s Plan B was send an email to NTL customer support. This story just gets better and better. The fax claim is genius. When planting explosives on an unsuspecting someone, you always remember to fax the right people in advance. Screw ringing them, that takes too much time in explanation. Next step in this is to display the piece of paper that was faxed. Slovakia should get someone Ireland trusts to do it. @ Colin – deadly, thing is I think people would have listened to Willie Joe too! Guys, guys – there’s a better way to resolve this. Clearly the Slovaks owe us now. We’ve got mates who are clearly talented at stowing bombs on people in airports. So next time Thierry Henry flies to Bratislava, we’ll make a call. Good job Colin boy, but why won’t the listen to Willie Joe when hes sayin UP THE ROSSIES!!! Fickle public I tell ya. @ shane – well come on, we don’t want to taken down an entire airplane. Some kind of surgical assassination would be best. Mossad might be lads to give us the few pointers there. @ Massey – Colin’s photoshop skills slightly eclipse your own, would you say? Was going to find yis a Slovakian hate figure But NO famous peopel in their entire history. What a lamearse country! Well, there’s Alexander Dubček and… Okay, he’s the only person on that list I’ve heard of. @Eoin – My skills at photoshop are quite sterile compared to the organic flourishes of Massey’s hand. That list of famous Slovaks is damn extensive, learned film director/producer Ivan Reitman is Slovak, so they also have a claim to his son Jason who’s popular at the mo. But besides that, you have to scrounge for international fame in Slovakia. Loved this post! The whole affair does raise some concerns though and if it helps tighten up airport security. If a bomber boarded a flight at Shannon we’d never hear the end of it. that’s assuming a failed attempt.